Photographers’ fast food break before the photography started. 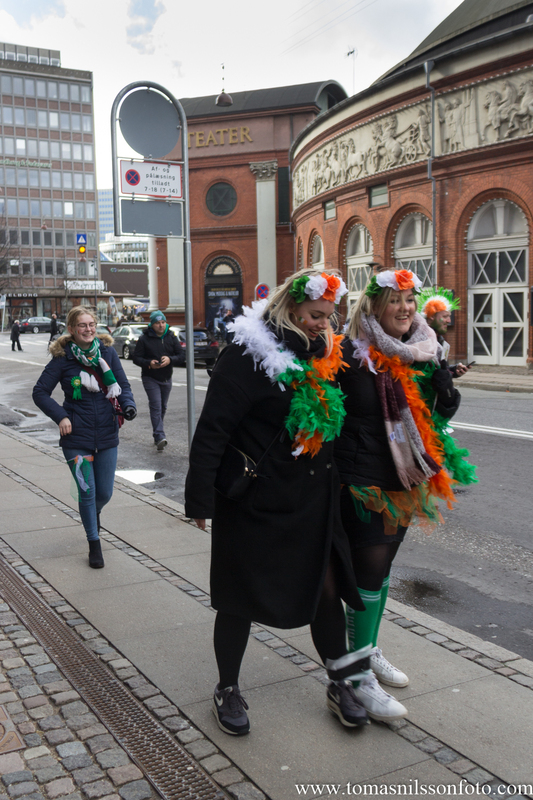 I’ve been coming to the St:Patrick’s Day celebrations in Copenhagen for several years to photograph the antics and hijinks of the revelers, and this year I got 7 of my fellow photo club shooters to come along. 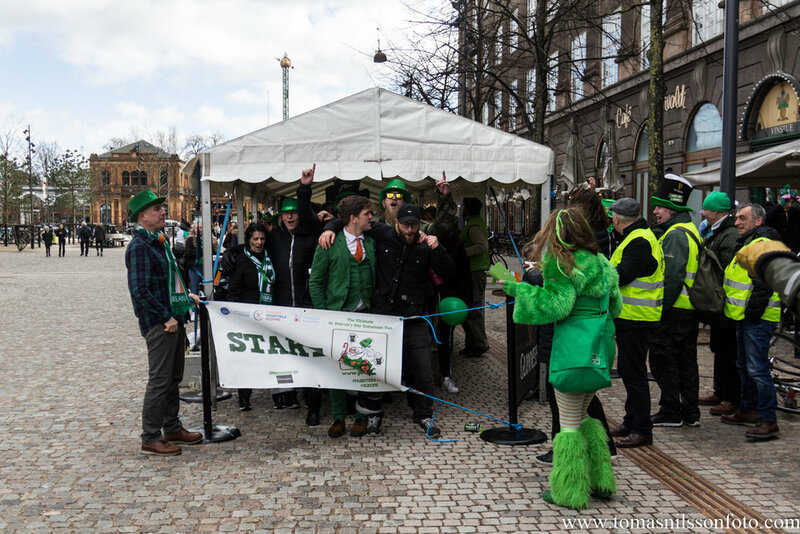 Everyone seemed to have a good time, even if the winds made the day a sometimes very chilled experience. At least we didn’t have any rain unlike last time I was there in 2017, when there was quite the downpour! The runners start from just across the street from the famous Tivoli Gardens main gate and then they have to run a 2 kilometer course where 5 pubs serve as pit stops where they are required to drink about half a pint of beer and get a stamp on their participation card before continuing to the next stop. I seem to recall one couple having done the course in less than 17 minutes a few years ago…personally I can’t see how they did this; given the distance, amount of beer to drink and need to coordinate your movements with another person, but I guess those guys are more skilled at all those things than I am! Anders getting his TLR ready to shoot. First in line…and they were very proud of it too. Where do they find suits like these? There’s also a musical program that takes place at Rådhuspladsen (The Town Hall Square) a bit later in the afternoon and a parade through the streets, but given the cold winds a few of the photographers who’d gone across the water decided that we’d had enough fun for the day and beat a not so hasty retreat back to the train station for the journey back to Sweden. I’ve shot the musical performances and dancers as well as the parade before though (see my Flickr album from the 2017 festivities for some of that), so I didn’t feel like I missed out on anything this year. 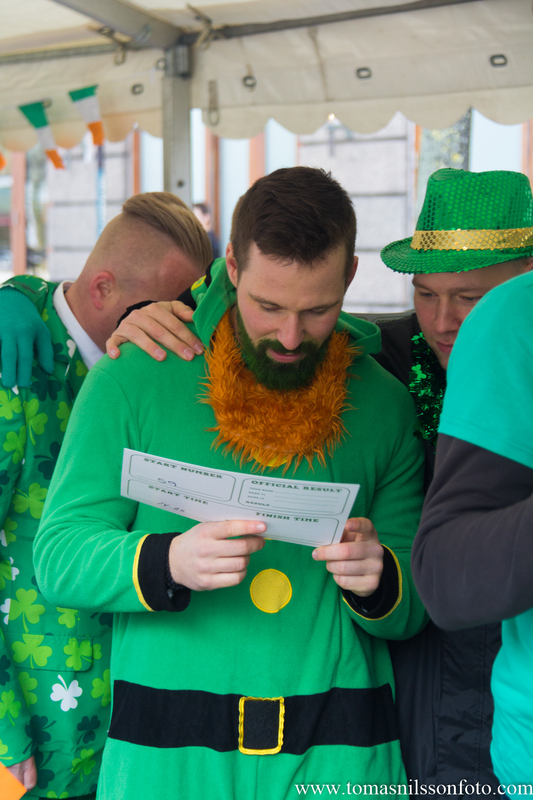 Taking part in these “Be Irish for the day” festivities is an excellent way of spending the day in Copenhagen, seeing people in funny and weird outfits and perhaps have a pint or two of the dark beverage of the green isle. Coming home with cool photos is actually more of a bonus for me at this point, since I’ve done the event so many times. Half the fun for me was seeing the looks on the faces of my fellow photographers seeing it for the first time, and from what I’ve heard they definitely enjoyed it too. It’ll be interesting to see their pictures at the next street photographers’ evening!